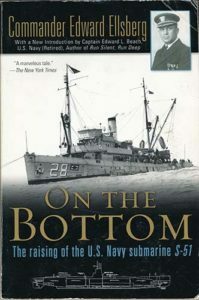 “On The BOTTOM” The Raising of the U.S. Navy submarine S-51. By Commander Edward Ellsberg. Introduction by Captain Edward L. Beach, USN (Ret.). Commissioned on June 24, 1922 the American submarine S-51 (SS-162) was based at New London, Connecticut. On the night of September 25, 1925, S-51 was operating on the surface in Long Island Sound near Block Island. Despite having her running lights “on” S-51 suffered a collision with the merchant steamer City of Rome. Only 3 of the 36 men aboard the submarine were able to abandon ship before the small vessel sank to the bottom in 132 feet of water. 33 U.S. sailors lost their lives in the cold Atlantic. The disaster stirred such a strong public reaction that Navy brass made the decision to attempt the impossible—to raise the 1,000-ton sub from the bottom of the sea. This gargantuan task was given to Lieutenant Commander Edward Ellsberg and a group of divers scavenged from the Navy’s entire fleet. Over a painstaking nine-month period, he and his men performed exhausting and terrifying work at unprecedented depths in hour-long increments—working against the severe, dangerous, and often unforeseen forces of nature—to enact a miracle of ingenuity and sheer will. This is the classic story of their stunning feat—told by the man who oversaw it from the beginning to end. Softbound edition, 253 pages, 29 historic black and white photos, 3 diagrams, an S-51 crew roster and index. Front and back book covers have some folds and minor dogearing. Difficult to find!